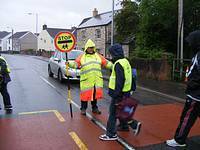 The Road Safety Unit is responsible for the operation and management of the School Crossing Patrol Service throughout the County Borough, including reviewing sites, recruitment, training and supervision. School Crossing Patrol Officers are employed, primarily to help children cross the road safely on their way to and from school. They can however stop the traffic for anybody who requires assistance crossing the road, provided they are at their designated site and within their hours of duty. When a Patrol Officer shows their stop sign, motorists must stop. Failure to do so could result in the driver being reported and a fine incurred or penalty points placed on their licence. All Patrol Officers within the Borough, are issued with two-toned coats, which are currently sponsored by Bay Radio. The uniforms are high spec, unique and consist of two high visibility colours. This uniform serves as a timely reminder to all drivers within the school proximity of the importance of slowing down, especially during the darker morning and winter evenings. At present we provide over 40 School Crossing Patrol Officers across the Borough to assist with the journey to school, so please assist them in keeping our residents safe by slowing down at or around their site, parking well away to allow them to be visible to all motorists and allowing them time to cross the pupils in their charge.